OSWEGO – Oswego Health honored its physicians at a special dinner held at the Oswego Country Club on March 28 as part of its celebration of National Doctor’s Day. Oswego Health President and CEO Michael Harlovic welcomed the nearly 50 physicians and their guests to the dinner and thanked them for the dedication to providing the community with exceptional local healthcare. 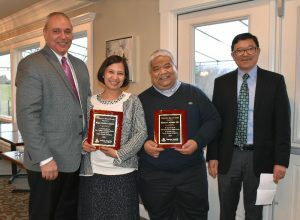 During the event, the health system presented several awards including the Community Service Award to two of its hospitalist physicians, Marie Castillo-Alcasid, MD, and Michael Alcasid, MD. The husband and wife physician team were among the physicians who helped initiate Oswego Hospital’s successful hospitalist program in 2008. 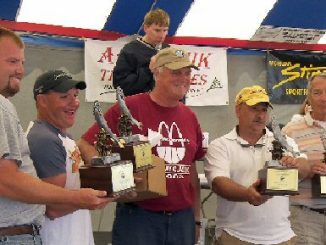 Honored with Oswego Health’s Community Service Award were two of Oswego Heath’s Physician Hospitalists. From left are Oswego Health President and CEO Michael Harlovic; Honorees Marie Castillo-Alcasid, MD, and Michael Alcasid, MD; and Oswego Health Chief Medical Officer Renato Mandanas, MD. They provide care for some 3,300 inpatients each year. These physicians keep themselves well-versed on the latest treatment trends, are compassionate and are highly respected by their patients and their families, as well as the physician community. 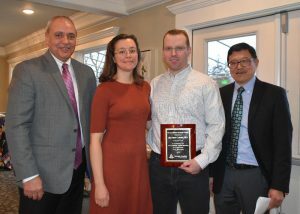 Oswego Health presented its Health System Champion Award to Matthew Liepke, who has worked to improve the health status of our community through many avenues. This includes providing care at the Port City Medicine Practice, seeing patients at Oswego Hospital, serving as a past president of the Oswego Health Medical Staff and providing the physician perceptive during the health system’s implementation of new electronic medical record software. Oswego Health also recognized physicians with 25 years or more of service. Honored for their 25 years of local care were Radiation Oncologist Jeffrey Bogart, MD, and Pediatrician Shashikant Bhopale, MD. Oswego Health recognizes its physicians each year on Doctor’s Day, which is traditionally March 30. This date marks the first time that that anesthesia was used in surgery.